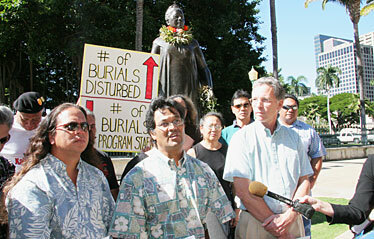 Halealoha Ayau, left, Moses Haia and Thomas Dye give statements to the press during a press conference at the Liliuokalani statue at the state Capitol supporting the state's Burial Sites program. Moses Kalei Nahonoapiilani Haia III, staff attorney for the Native Hawaiian Legal Corp., has become a force to contend with when historic or cultural properties come into question in Hawaii. As part of the nonprofit Legal Corp., he has taken on some of the largest corporations and developers on native Hawaiian issues, not to mention the state. Among them: 1250 Oceanside Partners, developers of the billion-dollar Hokulia luxury project in Kailua-Kona; Alexander & Baldwin Inc.; Wal-Mart Stores Inc.; and most recently General Growth Properties. In the Hokulia case, which lasted six years, Haia represented Protect Keopuka Ohana, a coalition of native Hawaiian cultural practitioners and environmental advocates. The 1,550-acre project was halted by Judge Ronald Ibarra in 2003, who said it was not a permitted use for agricultural lands, until a settlement was finally reached last year. Haia, a graduate of the William S. Richardson School of Law at the University of Hawaii, was a solo practitioner before joining the Legal Corp. in 2001, specializing in labor and employment law, civil litigation, water rights and native Hawaiian rights. He has represented farmers from Na Moku Aupuni o Ko'olau in their battle for a larger share of water diverted from Alexander & Baldwin's East Maui Irrigation Co. on Maui. Haia has also represented recognized cultural descendants of iwi, or native Hawaiian remains, found at the site of the Wal-Mart store on Keeaumoku Street as well as General Growth's $150 million Ward Village Shops project in Kakaako -- site of what was to have been Whole Foods Market's first Hawaii store. The Ward Village Shops project is believed by some to be a burial ground with a significant concentration of iwi. In November a judge denied a motion seeking to halt construction on the project, and work resumed on the Whole Foods store there. But while the court battle over the project was playing out, Whole Foods decided that another Hawaii site, at Kahala Mall, would be its first in the state. Kehau Abad, who has worked with Haia as an expert witness in Hawaiian archaeology on a number of cases, called him a "modern-day warrior." "We don't have the same kinds of battlefields as long ago," Abad said, "but he's fearless and willing to be at the forefront of a battle, and able to rally people together in ways that are productive. ... For all those reasons, I have a lot of respect for him and a real sense of admiration for the work that he has done." Mahealani Wendt, executive director of the Legal Corp., described Haia as "solid." "He's very dedicated," she said. "We can count on him to always come through."